By comparing genetic sequences in the eye tumors of children whose cancers spread with tumors that didn’t spread, Johns Hopkins Medicine researchers report new evidence that a domino effect in cells is responsible for the cancer spreading. 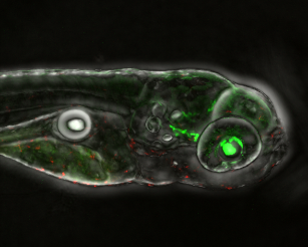 Their experiments suggest that blocking part of the chain of events — which they successfully accomplished in zebra fish and human cells — stops the growth and spread of the eye tumor cells. The new findings, the researcher say, offer a tempting target for treating the most common eye cancer in children — retinoblastoma — that originates in the retina. According to the World Health Organization, the cancer affects an estimated 7,000–8,000 children and kills up to 4,000 worldwide each year. A report on the experiments was published Nov. 6th in the journal Oncogene. To uncover the series of molecular actions involved in tumor spread, the Johns Hopkins researchers started by analyzing tissues from 10 patients — five of the patients had invasive tumors and five had tumors that were not invasive. The researchers compared the RNA profiles of these two groups and found a twofold to threefold increase in RNA levels for the gene that codes for activin A receptor type 1C (ACVR1C) in invasive retinoblastoma cells compared to noninvasive cells. This finding stood out because the activin receptor gene is already known to have a role in other cancers, including gallbladder and breast cancer. Researchers considered that the activin receptor may be a key target for suppressing cancer spread and growth in retinoblastoma. Normally, when the activin receptor detects a growth signal, it triggers cells to grow and divide. The researchers treated cells with the drug SB505124, which blocks the activin receptor from detecting other growth signals, to see what would happen. They put the cells with the drug on a filter and measured invasion by looking at how many cells moved through the filter. Results showed that the growth, proliferation and invasion of retinoblastoma cells treated with the drug were suppressed by 60 to 80 percent. After confirming the activin receptor’s role in spreading retinoblastoma in cells, the researchers wanted to see whether this worked in live animals. 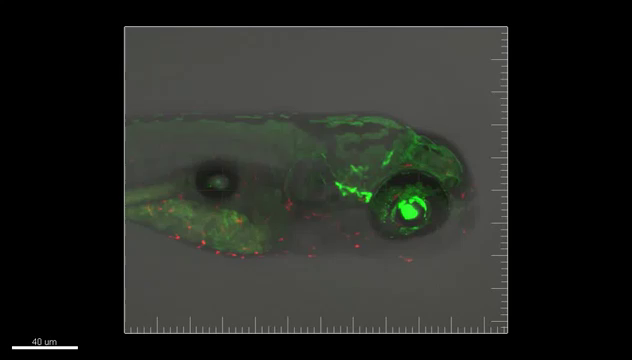 They next pursued experiments in embryonic zebra fish, since this convenient model hasn’t quite developed its immune systems yet and won’t reject other types of cells transplanted into it. 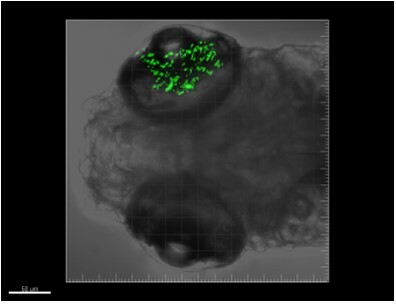 The researchers injected human retinoblastoma cells into 2-day-old zebra fish eyes, and they monitored the growth and spread of the cancer cells by measuring the diameters of eye tumors over the next four to six days. Then they administered the same drug (SB505124) used to inhibit the activin in the zebra fish eyes. According to the researchers, they saw a 55 percent reduction in the diameter of eye tumors compared to zebra fish eyes not injected with the drug. Overall, Asnaghi says, the experiments show that blocking the activin receptor could be effective in suppressing the growth and spread of invasive retinoblastoma cells in people. Charles Eberhart. Other researchers in the study include Alka Mahale, Hind Alkatan, Sahar Elkhamary, Saleh Al-Mesfer, Azza Maktab and Leen Abu Safieh of the King Khaled Eye Specialist Hospital, and Angel Carcaboso of Institut de Recerca Sant Joan de Déu. The study is funded by the King Khaled Eye Specialist Hospital — Wilmer Eye Institute Collaborative Research Grant, the National Cancer Institute (Grant R21CA229919), the National Eye Institute (core grant EY001765) and The Jenny Fund.